The Mac Diyer Kit proposes you different accessories to create your first e-liquids in DIY. This Mac Diyer Kit reunites all the neccessary to transfer, mix and stock your bases, boosters, aromas and concentrates. This essential kit is available for all DIY'ers..
With this Mac Diyer Kit, you have all necessary accessories, which are proposed to create your own e-liquids. You can mix your bases, boosters, aromas and additives with the help of 250ml Beaker and Funnel. 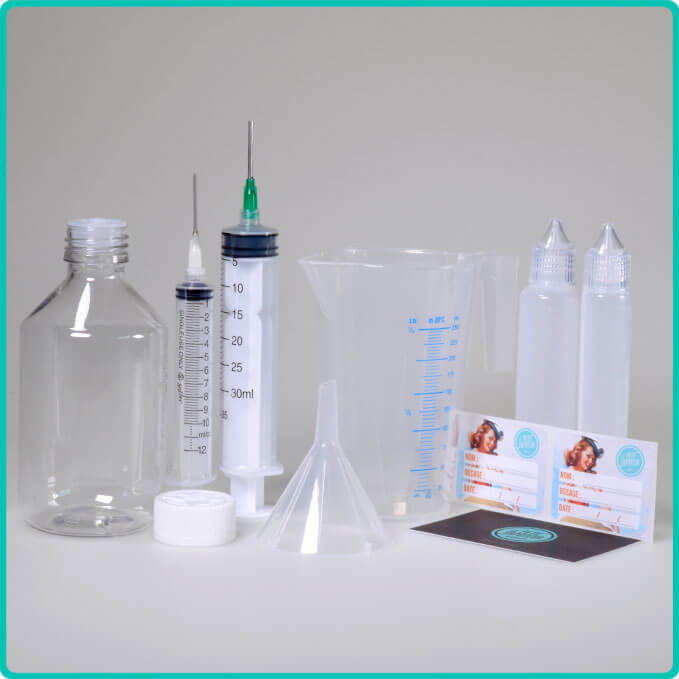 You can transfer your boosters and concentrates with precision gracious to the special DIY syringes. Finally, the Graduated Unicorn and Stickers allow you to store your preparations for the steeping (maturation time) of rigor.